People around the world Esther G Sea Taxi. I hope you enjoy these photos as much as I enjoyed the excursion and your great sense of hospitality. Thanks for picking us up at Goddard Hot Springs and all your extra efforts..
...Our first and foremost memory of Alaska was and still is, Davey Lubin and Sitka......Your enthusiasm grew with each mile nearing your volcanic island……. The hundreds of Murres perched in their cave and the fluorescent colors of the cave we slowly entered were treats we did not expect. Within a half hour you had spotted a distant spout……. We spent a good hour watching the whale surface, blow and breach as seals surfaced to check us out……. Our sincere thanks for providing the highpoint of our Alaska tour. ...We still tell all our friends what a great person you were…. Just wanted to let you know again how much we enjoyed our tour with you. It was one we will never forget. Keep up the friendly and personal touch you gave us. ...our honeymoon whale watching adventure. Thanks for helping to give us a memory that will last a lifetime. We had a wonderful time. Thank you so much for the wonderful mammal quest! We saw much more than we expected! We really enjoyed having you take us out to the Salmon Lake trailhead for our honeymoon adventure back in early July. We thought the treats you brought for us for the trip out were extraordinarily thoughtful. When we visit Sitka again, there isn’t any question who we will call for transportation into the wilderness, or sightseeing. The fact that you love being outside, and the fact that you love showing people beautiful and exciting places makes your line of work perfect for you – and it shows. …thanks for a great trip whale watching while I was up in Sitka. Still have a lot of fond memories of our day out at sea, it was a highlight for me!!! Thanks again for sharing your beautiful boat and enthusiasm for the natural world. Thanks for giving us the best boat ride around!! Your excursion was the highlight of our entire Alaska trip!!! We'll be back and we'll send everyone coming to your area to you for an excursion!! 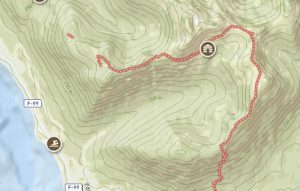 We really enjoyed having you take us out to the Salmon Lake trailhead for our honeymoon adventure. When we visit Sitka again, there isn’t any question who we will call for transportation into the wilderness, or sightseeing. The fact that you love being outside, and the fact that you love showing people beautiful and exciting places makes your line of work perfect for you – and it shows. … thank you for such an enjoyable trip out to Saint Lazaria Island. It was good to get a Black Oystercatcher on my life list along with the Ancient Murrelet and Rhinocerous Auklet. The whales were also a delight along with finding out what whale breath really smells like, I won't forget that!! … the highlight of our Alaska Cruise was not spent on an ocean liner but rather on the Esther G. The experience will last forever. Again, thank you for your hospitality and for sharing a little bit of Gods country. Meeting you and taking our little tour was a highlight of the Alaska trip for my son, Morgan, and I. I greatly admire your lifestyle and wish you all the best. Thank you for making my first wildlife adventure as a new Sitka resident (and for my family visiting from Chicago) a most wonderful time. The day was perfect and of course, the whale breath will be THE lasting memory. Woo-Hoo. To others, Davey shines with his enthusiasm for wildlife, the love for the ocean and the beauty of the out of doors. I've sailed with Davey twice again since then, each time is refreshing and new as our beautiful Southeast Alaska seasons and wildlife patterns change. …thank you for a GREAT time. We loved the tour that you took us on!! We also LOVED the skor bars ! ! YUM! YUM! Do you think your Mother in law would send the recipe. PLEASE! They were great too! THANKS! ! We had a fabulous time. Loved seeing all the murres, cormorants, pigeon guillemots, puffins, bald eagles, peregrine falcon, otters, sea lions, and whales. I can tell that you really love your business. And who wouldn't with such a beautiful back yard. But your knowledge and love of nature made the trip very special. I'll never forget it. The whole trip to Sitka was amazing. Just like to follow up on the outstanding day we had on the water. To bring us up close with “The Real” as I repeated myself by saying “Unreal!” Your knowledge and ability to share and teach is a true gift. 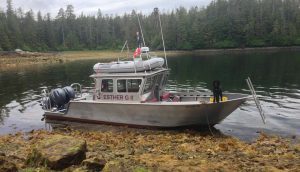 I left the Esther G with a better understanding of Sitka Sound’s Marine Wildlife thanks to you. Your passion and love for your work rubs off on your clients. Keep it going! …We saw more marine life that day with you than any one else in our group of 48 did on any of their sight-seeing days at any of our ports of call. I would recommend that everyone take the extended time to see the sea lions and seals that we saw. Whenever I know of someone coming to Sitka, I will be sure to tell them to spend a day with you. …What a wonderful evening tour, it could not have been better. Thank you from the bottom of my heart. You are perfect for the job. You will certainly make peoples’ trips to Sitka a highlight. 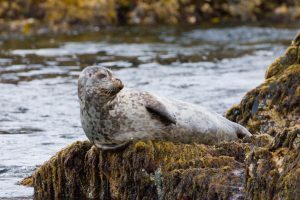 Your fabulous four-hour wildlife tour on the Esther G was the highlight of our week stay in Sitka. We've never been so close to a pod of whales or smelled whale breath until our tour with you. The trip to Saint Lazaria Island with otters, puffins, eagles, murres, cormorants, and guillemots alone would have been worth the trip. This is the best trip in Southeast Alaska. Those folks considering a trip with Davey can rest assured that he really knows his stuff and is a delightful host aboard his very comfortable boat. We highly recommend the four hour trip. Time just flies out there on the water. The trip you gave us out of Sitka was great. It was so good to have a guide who actually knows his birds!! We’ll meet again, I don’t doubt. We had a great time on the Esther G. - thanks to the magnificent surroundings, splendid weather, exciting wildlife and your enthusiastic and knowledgeable navigation of Sitka Sound. (Lisa's cookies weren't bad either!) We'll recommend you to all our friends who come to Alaska. I can't thank you enough for the wonderful trip to St. Lazaria. It was the highlight of our Alaskan trip. I have wanted to see a puffin for so long, and I can't think of a better time and place to have seen one. Not only did I see the puffins, I got to see where they nest. Plus, on the way, I was treated to whales, Bald eagles, cormorants, guillemots, and even an otter. What a trip! I will remember it forever! Thanks, again. If we're ever in your part of the world again, I'd love to look you up and take another trip. Just wanted to tell you how much our group enjoyed the trip on the Esther G last Sunday. What a beautiful area you live in and how fortunate you are to see all the wildlife and beauty every time you step outside. Sitka is a remarkably beautiful, peaceful place and we'll always have great memories of our trip. Thank you for showing us part of it and for making my son Dylan feel such a part of the trip. It was wonderful watching him as he saw all the whales, otters,puffins, eagles, etc. It was truly a breath taking trip. July 2004…Along with six members of our family, three generations, we traveled to Sitka for a week's vacation. Little did we know that our two trips out on the Sitka Sound with a knowledgeable and enthusiastic Captain Davey on the Esther G II would be the most stunning experiences of our week! 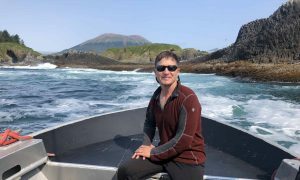 We were completely delighted by scenes of beauty and quiet magic as we skimmed around the islands while observing a multitude of birds, including puffins, and marine life, including four humpback whales, who performed for us. One whale dove under the boat voicing a booming sound that vibrated the Esther G II as we sat in awe………. ….Back home again, we look at one another and wonder, "Did we dream that we saw puffins and whales? Thank you so much for the 2 boat rides we took with you! They were amazing! I never dreamed I could be THAT close to a whale ever in the wild! You and your boat made my alaska trip MUCH cooler than it would have been if we hadn't done the rides. Thanks again and I will DEFINATELY be coming back to see some orcas next time…..
…we want to thank you for the best trip yet we've had to the [Goddard Hot] Springs. The boys and we thoroughly enjoyed seeing the sea lions and the humpbacks on our return to town. I thoroughly enjoyed the trip to St. Lazaria Island on the Esther G. Your deep knowledge of the wildlife and good humor are a great combination. This was a once in a lifetime opportunity to see the Tufted puffin, Pigeon guillemot and Black oystercatcher in detail (whales, sea lions and otters to boot). I will recommend this trip for any birder who makes it to Sitka. Thanks for a wonderful excursion this morning. Terry, Evan, Susan and I enjoyed your company as well as the exciting and informative tour of the bay on the Esther G. The bagels and smoked salmon were wonderful as well. Here are the orca photographs…. Barry and I thoroughly enjoyed our boat trip, you made it very interesting. This was our first family trip to Alaska, and something we looked forward to for months. Our trip with you exceeded our high expectations and created special memories of marine wildlife and birds we will carry a lifetime. We gaze at our pictures of the sea lion colony, the sea otter rafts, the humpback whale spouts, bald eagles and puffins in disbelief that we saw all this in one cruise. Thanks for the professional tour service. Your energy, enthusiasm and knowledge greatly enhanced the experience for all in my family. It is obvious that you love your work. We are back in Florida and thousands of miles away, but in our minds eye we are still on The Esther G II taking in the splendor off the coast of Sitka. Thank you!!!! This is Kris Bridge, the lady who visited after 50 years in exile from Sitka. Thanks again for the magical tour - It was so great (even if we never smelled the whale breath). Attached are some pictures from our wonderful cruise on the Esther G II. We had such a wonderful time, and I'm still thrilled when I look at the pictures of the wildlife we saw. It was a great day, and we really enjoyed getting to spend some time with you. Hope we get to see you again soon on our next trip to Alaska! We enjoyed the trip with you very much. It was one of the highlights. We know someone who may be doing the Alaska cruise soon and we will certainly recommend you. In fact, I would suggest a 4 hour trip…. What a great day we had with you. You gave us so much attention and we really felt so well cared for and safe. The trip was exciting and adventurous too! We saw so many great sites: the salmon running, eagles flying, humpback whales all around us, diving and spewing (love that whale breath); and the most beautiful scenery of trees, mountains, and waterfalls. It was all so special and wild, not commercial or touristy. All this in just a half day, how amazing you are! It was very inspiring. Anyone who wants to really experience the beauty and wonder of the Alaska coast would be lucky to have you as a guide Davey. …we were on your boat last week to see Whales! We had a great time, it was truly the highlight of our cruise! Thank you so much for a wonderful afternoon! My husband and I would love to fly up to Sitka sometime and have you take us around again…..Tell your wife "thank you" for the awesome cookies too! Just wanted you to know how much I enjoyed your Marine Tour. Your knowledge of birds and other marine wildlife really raised my knowledge level several notches. As a guide, your articulate delivery of information is the best I've encountered in years of travel. My afternoon spent with you aboard the Esther G will long be remembered as a highlight of my visit to Sitka. Thank you so much fo such a great experience. it was the highlight of the trip for all of us. We were all able to get good "tail" pictures, which is something we were craving. We loved being able to see otters, puffins, sea lions and eagles and the great weather was just the "cherry on the top". We were all happy to have met you and to have had such a wonderful guide. Mary and I had a great Alaska trip and returned home safely. Thanks for the memories. I am one of your very, very satisfied past customers. My Mom and I were lucky enough to have spent a wonderful sunny afternoon with you as our guide watching whales breach and the ocean sparkle. Although, we were there almost 11 months ago now, I still remember your wife’s great cookies you shared with us. The afternoon we spent with you was truly the highlight of our Alaska 7 day cruise. I just wanted to send a note of thanks for the great experience that my son and I enjoyed with you on the Ester G. It was truly a feast for all the senses. From the beautiful weather to the sights, sounds, smells (whew!!!) and spray of the humpback whales exhalations in our faces, the puffins, muries, eagles, otters, sea lions and of course your wife's tasty cookies. This was a very memorable event in our lives that we will never forget and plan to repeat someday soon. I have told everyone that I know about the friendly, enthusiastic and informative manner with which you conduct your wildlife excursions. I have and will continue to heartily recommend that anyone visiting Sitka take advantage of the opportunity to spend a day with you on the water and get in touch with the real Alaska! …just wanted to let you know that Justin and I had a great time whale watching with you in July. It was the highlight of our trip! You were very knowledgeable about the puffins and local wildlife. We're glad to have located you when we were in Sitka. This was the best excursion we booked on our entire cruise! We had a great time. We saw sea otters, seals, puffins, whales and eagles. The boat and the ride itself were terrific, but what really made the trip so good, was Davey. His knowledge, expertise, and enthusiasm for sharing his beautiful surroundings with visitors really shined. He has a beautiful spirit about him. Thanks again! …just a quick note to tell you how much I enjoyed our outing on September 22nd. It was a fine day, with smooth seas, hearty seafaring songs, delicious cookies, and lots of wildlife to look at. Hi Captain Davey, just wanted to let you know that the tour you gave us was the very best I've been on. It went way past what I expected and I really appreciate your efforts to get us close to the sea-life without scaring the animals or hurting anyone. You are really a skilled captain. It was the most fun I've had in quite awhile. I will definitely keep your number for my next trip to Sitka. Thanks again! We have nothing but raves about the trip we took with you. We literally and completely loved it. My friend SueAnn smiles and just can't get over being so close to whales and how you made it so real and exciting. Believe me when I say that if and when we ever come back we will be sure to look you up. My husband, David, said that if he had been in Sitka another day he would have begged you to take them out again. Again, I want to thank you for all your help and the fun time you gave everyone. Monica and I had a FANTASTIC time aboard the Esther G. You truly helped define one of the highlights of our Alaskan cruise. Thanks again for a great whale watch excursion and the yummy homemade cookies! Wow. Was this a great trip! Going out on the Esther G II was the HIGHLIGHT of my two week trip to Alaska. We were lucky enough to have beautiful weather and calm seas. My family and I were so excited. We saw dozens of whales, sea otters, and eagles; all of which I had never expected to see so close. I never dreamed of seeing so many creatures in the wild at the same time. I really enjoyed the two types of puffins and I was taken back by the various and beautiful colors of starfish among the rocks on the little island. Thanks so much for a once in a lifetime trip aboard your boat. I, my husband Randy and our friends took your excursion on July 22nd. We had a fabulous time and got some great pictures. It was the best shore excursion that we had taken. Thanks for a great experience. The day spent with you was just wonderful. You know, the first time we came out with you I didn't think there could be anything more spectacular than the experience we shared and my beloved humpback whales. But you proved me wrong, this year’s adventure was by far the best. The beautiful scenery, the dinner, and of course the outstanding show-off whale we encountered….. People could not believe me when I told them we had our own personal whale waiting for us, (at least it seemed that way). To this day it amazes me when I think back on how that whale just stayed there splashing its tail and showing off the way it did. Listening to the video brings back all those very fond memories. Davey, thank you again for all you did to make our day with you special and for the most awesome trip to Alaska so far. The highlight of our trip from a nature point of view – which was why we wanted to go to Alaska in the 1st place, was Davey Lubin on the Esther G II. He was great; we saw sooo many whales and even saws one slam his tail numerous times. I would recommend this trip to anyone. He was knowledgeable and safety-conscious, and we saw and learned so much. He asked us what we wanted to see – I said Puffins - - - and there they were!! I said Otters, and there they were again! The three hours just flew by, and we saw almost three hours of non stop wildlife, and learned about how the national wildlife preserves were created and why. He also gave us a history lesson of Sitka, where to hike and what was off the beaten path, and his wife’s cookies were great. …I just felt I needed to contact you and let you know that the hours we spent with you were the hi-light of our Alaska vacation. It was our 20th anniversary and you made the day very special. Thanks again for the wonderful tour and intense whale watching. We will be back and will do it again! Davey, thank you for a fantastic evening tour. It was wonderful to see the whales with calves, otters with pups, puffins, and more. If we come to Sitka again we will definitely call you. …It has been a whole week since you took us on our adventure in the waters around Sitka. We certainly wish we were out there again. Your tour was the highlight of our cruise that was filled with many exciting moments. Your expertise and free-spirit really made the trip. Seeing that humpback breach right in front of us was for us a thrill. On top of that, your wife's cookies were out of this world. Thanks for a great trip. Pigeon giullemot, black oystercatcher surf scoter and black turnstone photos are excellent! I will send them. Your wife's cookies were the best! Thanks for your beautiful words. We had an amazing day, your company was just wonderful…Thank you again for being so wonderful! Just a short note to tell you again that our trip with you was the total highlight of our July 2005 Alaska visit. We have taken tours and we have taken "your" tour. Your knowledge, honesty, sincerity, obvious love for your home and environment, and dedication to those who travel with you set you a step above the others. I do not recall ever having used the word "amazing" as often as I did on our trip. Thank you and I assure you that when we return to Sitka we will travel with you again. Thanks a million for the once in a lifetime experience! After taking my mother and me out on an evening tour, I must recommend Davey to anyone wanting a marine wildlife adventure. Davey found 2 dozen whales surface-feeding. It was spectacular. You may never get to see such a sight in your life. Davey Lubin is one of those rare people in life whose job is their passion. His knowledge of the Alaskan waters, its wildlife, and geology is unsurpassed. You would be doing yourself a great favor to take a trip on the Esther G while in Sitka. Oh, and a big bonus, his wife's homemade, secret-recipe cookies are awsome. We came into Sitka on the Infinity and because of a snafu with the cruiseline we had to get our own wildlife excursion. Thank God for snafus! We found Davey and had the absolute best time in Alaska. Our tablemates did the cruise excursion and it did not compare to ours. We saw whales, puffins, sea otters, eagles, a sea lion and so many birds I could not remember all of them. The ride was great and getting Davey's insider view of Sitka was a bonus. He is a great guide, concerned with his guests and wanted to give us the best excursion we could have. On the way back he spotted a huge horde of jellyfish which lit up the water and Davey made sure we got a chance to see it. If we ever get back to Sitka, Davey and the Esther G will be a must do. We arrived home from Alaska this morning. We are fresh with the glow from our Alaska vacation. Certainly a highlight of our trip was the great tour of Sitka from the Esther G! Thank you for showing us Sitka from the viewpoint of a biologist and resident. We wanted to let you know again what a wonderful trip we had last Monday. All afternoon we talked about what a great adventure we had and all the animals we were able to see. We are already trying to figure out how we can come back as quick as possible. Thanks for making our vacation the best! Thanks for the fun and professional trip. You have a great boat and report with people. It was nice to just hang out in the bow and see everything. I am proud to let people know I know you! This is just to let you know how much we enjoyed the opportunity you provided for us to observe many of the Sitka mammals and birds in their natural environment. We especially appreciated your concern that the content of the tour related to our specific interests and that we felt safe and comfortable throughout our time together. Your technical expertise, knowledge of local history and outgoing personality made the trip the highlight of our two week vacation in Alaska. Thanks again for a wonderful experience. …thank you on behalf of Penny and myself for the wonderful trip and educational lesson aboard the Esther G II. It was a learning experience we will always remember. “…we spent the day on the water after meeting Davey Lubin, who runs the Esther G company, and had a magical day. We saw orcas and then sat surrounded by tufted puffins, murres, ancient murrelets and many other birds. I was already in heaven at this stage but as the sea otters lounged around us I had a feeling this was leading to a pretty special week and more was to come. We headed back towards Sitka and found ourselves surrounded .by humpbacks. This was the first time I had encountered whales and being in a small boat and so close was just wonderful. We sat not knowing which way to turn as they were blowing in every direction………. …I was on the all-girl trip last week and wanted to tell you how much I enjoyed it. It was the highlight of my cruise. I'm so glad I didn't book the cruise excursion but rather waited until we got onshore. Everyone on the ship I talked to who went on similar but larger tours was very jealous when I told them about my trip. We saw everything I hoped for and had great cookies too! Thanks again and be assured that I will highly recommend your tour to everyone. …how very much we enjoyed our boat trip with you…Your knowledge is amazing and we appreciated you sharing it with us. If ever we know anyone going to Sitka, your name will be on the top of the list of things to do. Thanks for a great ride. Thanks so much for taking us out for a wonderful whale-watching tour. Seeing the flukes of the humpbacks was great, but nothing compared to seeing the group of them breaching! What a sight, to see all that mass shooting straight up into the air. It made our visit to Sitka unforgettable. e just wanted to let you know what a great trip we had with you. It was AMAZING. Your zest and zeal for the wildlife was infectious and created a LIFETIME EXPERIENCE for both of us. Everyone that I have told and all of my friends and family were awestruck by the experience you gave us. Thank you! To anyone considering taking a trip with the Esther G, we had a wonderful trip to St. Lazaria Island where we saw an amazing encounter between a humpback whale and 3 orcas and a baby orca. Davey is a kind, gentle spirit and loves sharing his world. He went out of his way to make our trip extra special, even serving delicious salmon, crackers, and homemade cookies:) He is very knowledgeable about wildlife and the area around Sitka. His love of Sitka is contagious. It was the highlight of Alaska for my family. Thanks for the memories as we go forward on this journey called life. Thank you so much for the safe and enjoyable trip from the Kruzof Island wilderness back to Sitka. Given the rough weather that day, my Outdoor Leadership students appreciated your captaining, and so do I. Thanks again! I want to let you know that we certainly enjoyed the tour we took with you on Aug. 29th. I still can't get over being so up close to the Orca whales and the humpbacks. We took some great pictures. All of the wildlife you got us so close to was just unbelievable. You offer a great tour and I will highly recommend you to others when I hear they are going to Sitka. Again, thanks for a wonderful experience. Take care! It was a dark and stormy night. No, wait --- actually, it was a gray and stormy morning. I had my doubts that we'd see any wildlife. (In fact, I had my doubts that we'd ever see land again!) But it didn't take expert Davey more than five minutes, navigating through that pea soup, to find those humpbacks. Happily feeding, they gave us quite a show. What magic! Thank you! Hi Davey, we thank you very much for sharing your Sitka with us on our anniversary. And, thanks for the cap too!!! We enjoyed every bit of our time with you...especially the whale breath!! OMG!! We certainly hope to return to Sitka again someday and will be sure to take another trip with you. When we met Davey on the docks of Sitka, he whisked us out to the bay for the start of an absolutely amazing time. Seeing the Humpbacks much closer than possible while on the cruise ship was great. The variety of birds, seals and the surrounding areas were also really cool. But the most spectacular event of the day, and even the entire week-long cruise, was the time we spent watching the Orca whales. Watching them splash and swim so close to the boat was something I will never forget! It was practically the only thing my family and I could talk about for days! They repeatedly thanked me for taking the initiative to book the tour with you. So, thank you Davey for one of the best experiences ever. I, and my family, look forward to our next tour with you. Thank you, Davey! I just wanted to email you another big "thank you" for the wonderful excursion you provided for my sister and me. We had such a great time. Your obvious heart-felt enthusiasm for the care, feeding and protection of our earth's most valuable and precious gifts is noteworthy and contagious. It is just so unbelievable that there is a part of the US that is so untouched by commercialism and a place where the environmental elements, its resources and all those amazing animals, birds/fish/4-legged/2-legged/winged/fur and finned, can thrive and survive. What an absolutely extraordinarily wonderful experience - which I will never forget. Not the sights, sounds...nor you. I just want to let you know that you are the best wildlife guide I have ever met! Thank you for showing us the natural beauty around your island. I can't believe that in one tour you managed to show us whales, seals, sea lions and eagles. I will never forget the whale that jumped from the ocean right in front of the boat. It was unbelievable!!!!! Must say, that everything was so organised and your wife’s cookies were delicious! Can't explain in words my feeling about our tour, but I know for sure that it was my best day in Alaska!!!! I will certainly recommend you to my friends. I wanted to say thanks so much again for the great whale watching. I thoroughly enjoyed myself and was pleased to see at least one whale breach. I have 3 pictures of the peregrine falcon we saw and will send them when I get back to California. Cris & Rob here, from England! We are writing with regard to our fantastic trip we went on with you last 14 September: “ Sitka: by far the best port of our Alaska cruise and one of the most beautiful places we have even seen (and we saw a lot!). The weather was gorgeous, and the place looked like Paradise. We organised our independent tour, with Davey Lubin, and I cannot recommend him enough. We were on the Esther G, of course, with four other people plus him, and we had a jolly time. We followed the whales and orcas, saw lots of cormorants, seals, starfish on the rocks, and on and on. It was a very personalised tour, we felt free to explore the area with our new friend at the helm. He was very informative, professional but fun at the same time, and we enjoyed his company and his tour enormously. Seeing the local fauna with him felt adventurous and not “standardised” as many other tours prove to be. We stayed outside most of the time, enjoying the sun, the crisp air, the occasional sea spray lifted by the boat and the incomparable beauty of nature. The whole effect of speed and nature was intoxicating. Breathtaking. We also greatly enjoyed the break, when we were offered the most delicious home-made cookies imaginable. We almost felt like family. This was definitely a highlight of our trip. On arrival back to the harbour, we saw two huge sea lions swimming just next to our boat. A nice good-bye, hopefully not a final farewell. Thank you so very much for the wonderful evening tour, My out-of-town family loved their time with you. Our niece was especially impressed since she’d never seen anything like this before in her life. They appreciated learning all about the whales and their habitat and will never forget the whale breath!! You truly made their October trip to Sitka a memorable one. Thank you for your generosity, enthusiasm and kindness. Thanks again for an incredible tour, it was certainly the highlight for us! Thank you so much for the great tour of the waters and wildlife around Sitka. You are a true professional and very knowledgeable about the environment you live in. My wife and I felt right at home for the more than 3 hours we spent on your very well-kept boat. Our experience on your tour will be remembered for life. Hope to get back there again. Thank you! for the wonderful trip. It truly was wonderful, one that we will always remember. 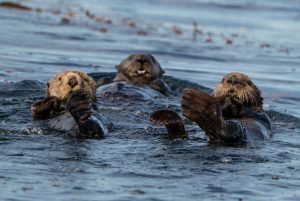 As promised by a couple of desert rat land lubbers, please find attached the picture of Sea Otters we saw while you sailed us around the Sitka Sound during the last week of August. We were visiting Sitka as a port of call while on the Statendam. We had the best time on your tour. Thanks again! We're still reliving our excitement and the joy associated with our Alaska trip and thanking you again for all your friendship, for a wonderful trip and for your kindness to us. I certainly enjoyed your trip and would recommend the experience to anyone. I hope the whale ID picture helps to identify the very cooperative humpback whale we saw. Your trip was undoubtedly the highlight of our holiday. Your tour certainly was the highlight of all our days in Alaska, from both weather, education and overall great time! Scott & I both wanted to thank you again for the best day of our vacation, by far. I can tell you that I was sitting up on deck as our cruise ship pulled away, with tears rolling down my face. I still get weepy thinking about Sitka...there must be some magic there! The part of Sitka that we were lucky enough to see was spectacular, and we look forward to coming back for a longer stay next year, with our boys. My friend Teri and I really enjoyed our tour with you. Keep up the good work educating people about the beautiful marine flora and fauna! Capt Davey!! He ROCKS!! The best excursion I had, hands down! He's lived there 25 years and you can tell he truly cares about the area and the animals. Do yourself a HUGE favor and book him if you get the chance! You won't regret it. Thanks for the INCREDIBLE trip. I'll be highly recommending you as much as possible. Connie and I wanted you to know that the 4-hour trip we took with you on our recent Alaskan cruise was the highlight of our trip. Your knowledge of the Alaskan ecosystem and wildlife can only be characterized as SUPERB! Seeing the whales and other native animals in their natural environment while cruising through the untouched beauty of the land and sea was certainly something the two of us will always treasure. Thanks for making us feel very comfortable on board your fine boat and for displaying a personality that made for a most memorable trip. For people coming to Sitka, they would be well served by booking a tour with you and I'll do my part to encourage others that going out on the Esther G is a great decision that won't disappoint. [Yours] was one of my favorite memories of our trip and the praise to you is so over-due (2006 Carnival Spirit). Jeanne and I are so glad we did not take the regular cruise excursion and always tell people who are thinking about an Alaskan cruise to look you up if stopping in Sitka, always adding they will not be disappointed. We have all talked about another Alaska cruise for 2010. I am in hope we can all come together again and be sure, when stopping in Sitka, we will book with you again. Thanks for the smiles. Arnie and I have not stopped talking about how beautiful Sitka is, especially from the deck of the speedy, agile Esther G. Your skill at piloting the boat close enough to hear the whales and see the sea otter babies was breathtaking. And your enthusiasm for family life in Sitka gave us an authentic introduction to why people in the "lower 48" might choose to live up there. Thanks for being such a wonderful guide. Just wanted to let you know what a great experience we had being on the Esther G on Friday, June 15. We were your last tour that day (3:30,) and you were kind and gracious enough to let us know that the sea was getting rough and that we’d probably not see the animals that were usually seen on your tour. We decided to take the abbreviated tour of the islands and saw otters and a few bald eagles. I was captivated by the beauty of the land around Sitka and was more than thrilled that we got the chance to see it with you as our guide. However, what an unexpected surprise (and the highlight of our Alaskan Cruise) when those two humpbacks rose out of the water like twin pillars with their exposed baleen, filled with herring. I was so shocked that I didn’t get the picture taken soon enough :-), but that memory is forever seared in my wife’s and my memories! Thought you’d like to know how appreciated you are. One of the most unique and wonderful experiences we had on our Alaska trip. The Esther G was the perfect boat for sightseeing and Davey shared a vast knowledge of Sitka's wildlife with our small group. 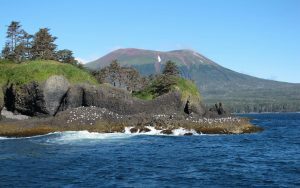 We experienced close-up encounters with gray whales, otters, sea lions, puffins, eagles, starfish and a variety of sea birds on St. Lazaria Island. Davey was one of the most awesome guides we've ever had and this tour is definitely a must if you are visiting Sitka. We can't wait to share the great wildlife photos we got that day with family and friends. We had such a great time on the wildlife tour! Thank you so much for making sure that everyone on your boat had a great time! It was definitely a highlight of our vacation. The tour felt very much like it was just a bunch of friends out on a boat for the afternoon--you have a great way about you that made us feel right at home! Sitka Sound was beautiful and we loved seeing all the wildlife--I've never seen so many whale flukes on any whale watching tour I've ever taken. If--or I should say when--we return to Sitka, we'll definitely be booking with you again. And, the cookies would pretty good too! Just wanted to say we had a great time on our outing with you last week. And I got some great photos. We’ve talked about you and the great time we had on your boat. It was THE highlight of our trip to Alaska. Just wanted to let you know how much I LOVED the whale-watching trip! It was so much fun. I am so bummed to be back at work today! You really made the trip so much better than it already was. It was great meeting you. Can't wait to come back to ALASKA!! I just wanted to thank you for such a wonderful trip. We all had a wonderful time. You were great with the kids and the whales put on quite a show for us. I can tell that you truly love your job by the excitement that you showed throughout our morning. I will highly recommend you to everyone traveling to Sitka. You took me, my mom, and some of my relatives on a whale watching tour July 7th. I wanted to thank you for the amazing trip that you gave us! You were very knowledgeable about all the wildlife we saw, and we just had an awesome time! Thanks again for your hospitality. My mom and I basically fell in love with Alaska and we would love to get back soon. My mom, sister, wife and I had a great time on your boat. Laura and I have been to Alaska on three different occasions and your tour stands out as the best we have taken and will remain a fond memory for years. Your knowledge and love of the area is habit forming to the passengers on your boat and your wife's cookies are the best. We still talk about our whale-watch (from 2003) with anyone who is interested in going to Alaska. We have a photo of a whale's tail hanging in our kitchen that I took from your boat. I just finished passing your name on to some people that will be visiting Alaska in the next few months. We talk about the whale-watching trip to anyone who will listen. We had so much fun that day! I have to say that this was one of the best of our excursions of the entire trip. Captain Davey’s love of this area is evident and he made sure we were getting our money’s worth from him and his boat. I wanted to say thank you again for the wonderful trip we had with you. You made me still have faith in people after all the specialties you do for your customers. I just thought you needed to know that we really enjoyed our time together. I will recommend you to everyone headed to Sitka and I sincerely mean that. I hope you never change and stay small and enjoy life up in God's country. If we ever get back, I will look you up and we can do it again. All six of us loved our time on the water with you in your Esther G in August. Your obvious love for and skill at getting around in Sitka Sound was remarkable. Even though we only met when we boarded, we soon felt like part of your extended family. We know there are several others who offer the same kind of service but can’t imagine anyone who does it as well as you. Thank you for a fantastic afternoon! I wanted to thank you for the most amazing excursion! Out of the 16 cruises my husband and I have been on, your tour was one of our BEST! I didn't think it was possible to see that many whales in one tour. I swear at one point in time we had 5 whales around us! But that was just the tip of the iceberg.....you just kept finding more and more! How many people can say they've smelled actual whale breath!?! I especially loved seeing the Gray Whale......just magical! We had such a fun time learning about the wildlife you have such knowledge and passion for! You truly live in God's country and you are one of its voices. On behalf of my husband, my Mother and myself........Thank you truly for a trip of a lifetime! You're the BEST! …………..you made it the most enjoyable excursion on our cruise. We learned a lot about the local wildlife and even smelled whale breath. I have given your website to everyone who inquires and will in the future. I even tell them that you hand out homemade cookies. Any way thanks again and we will book with you in 09 when we cruise Alaska again. Thanks so much for our adventure on your Esther G. We will always remember you and your beautiful Alaska. The cookies, the sailing, songs and your knowledge and humor will always be a part of our wonderful vacation. We wanted to thank you again for such a great time, your trip was the highlight our vacation!!! We did thoroughly enjoy the time with you and felt it was the highlight of what will undoubtedly be our last Alaskan adventure. It will be our fondest memory of Alaska. Thank you so much for giving us such a wonderful trip. We talked about your trip for days afterward. The amount of wildlife and marine life that we saw was amazing. The beautiful, rugged, unbelievable scenery is something we'll never forget. Thank you for making it so special for us. Your love, knowledge, and excitement of the area was a bonus for us that we couldn't have gotten from another tour boat. The knowledge that you have of the area gave us the unbelievable opportunity to see the grey whale and the humpback! Then on the way back you gave us another chance to see a bear and the brown bear came out for us to see! It was so exciting to be so close to such beautiful wildlife and landscape. It felt like we were a part of it for a short while. Thank-You! We want to thank you for the wonderful time we had on our 3-hour wildlife marine tour on May 30. This tour was definitely one of the top highlights of our whole cruise and by far the most personalized. Your knowledge of Sitka and wildlife was incredible and extremely interesting. We loved seeing the humpback whales, sea otters, and the various birds in their own natural environment. What made our tour even more special was that you went out of your way to look for humpback whales for us. After visiting the other ports on our cruise, we would have to agree that Sitka is the most beautiful and least commercialized city that we stopped at. Without hesitation, we will recommend your tours to any of our friends and family visiting Sitka. Once again, thanks for everything. Thank you again for a wonderful tour of the Sitka wildlife habitats. The time that Diane and I spent with you was definitely one of the highlights for our Alaskan visit. If we hadn't boarded the Esther G we would have never seen the diversity of wildlife that you exposed to us. Your knowledge and congeniality added to our enjoyment, as did Lisa's wonderful chocolate chip cookies. I just wanted to say thank you again for one of the most incredible trips that I have ever experienced in my life. I have traveled to many places and my new love for Alaska is just incredible. Please feel free to give out my phone # (580-603-0770) and email (ellenrn2@yahoo.com) to anybody who might want to contact me for a reference. Thank you for such a wonderful experience in Sitka. We'll never forget our day out on your boat, and all of the wonderful wildlife and scenery that you were able to show us. We're already planning a future trip to Alaska to include more time in Sitka. I just want to thank you again for the wonderful tour of your beautiful Sitka by the Sea. This excursion was the best of my entire trip to Alaska and I will someday come back to visit again. I wanted to tell you also what a wonderful experience your excursion was for me. Sitka was by far my favourite port and the photos I took and the time I spent there was just the highlight of the entire cruise. I will recommend your excursion, without hesitation, it was the best. Your wife’s choc chip cookies just sealed the deal. Many thanks, and should I be in your neck of the woods again one day, I'll be sure to book your trip again. Thank you for such a wonderful tour, it was one of the highlights of our trip. We all had such a great time seeing the wildlife and my brother was thrilled to see the birds on Saint Lazaria Island. I will not hesitate to recommend you as “The Guy in Sitka”. Jim and I wanted to thank you again for a FANTASTIC tour last Wednesday! We both agreed that it was the best tour we have been on in our three trips to Alaska. Hopefully, next time we get to Alaska we can go on another trip to see the wildlife with you! We really enjoyed the day and would do it again in a heartbeat. My only complaint is that the day went by so fast. It was a terrific experience and you are so blessed to be able to enjoy the scenery on a daily basis, as we were to share it with you. Your stories and the spots we visited made the day a great one that we will never forget. 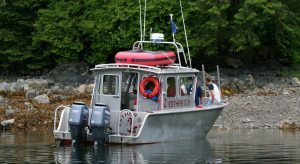 With your considerable background and expertise, you provided us with such a memorable tour of your beautiful Sitka Sound. Your knowledge of the wild and marine life of the area as well as Alaska history really added to our appreciation of this incredible state throughout our trip. We feel very fortunate to have experienced this area through your eyes. Thank you so much for the indelible imprint of this part of Alaska on our hearts and minds. Thanks again for the great trip you took my wife and I on, we will never forget it! We REALLY enjoyed the excursion .... Your narrative, the calm water and the outstanding wildlife all contributed to a perfect outing! Here’s to memories of a great day aboard the Esther G in early September. Our trip out with you was a highlight of our three-week trip. Thanks for everything! My husband and I recently had the wonderful experience of your hospitality when we were in Alaska earlier this month. I just wanted to tell you your tour was one of the highlights of our trip to Alaska........ To see Sitka and Alaska through your eyes was such a treat and one that Jim and I will remember for a long time. If ever we return we will be sure and book some time with you and we have already recommended you to several friends who may travel to Alaska in the future. There are a few experiences in a person’s life which remain firmly etched in memory. My afternoon of whale-watching on your boat was one of those moments....... right up there with watching the sunrise over the Grand Canyon or seeing Paris for the first time. Thank you so much for a wonderful afternoon. This was a wonderful vacation for Larry and myself to visit your grand state of Alaska! On this vacation we went on quite a bit of varied excursions at different ports of call: so with that, it is my hope you see and receive this heartfelt compliment... what you do by sharing your love, skill, passion, enthusiasm, respect of nature to others is quite special. It is your genuine enthusiasm that delivers your entire message. Your excellence is noted! Please let my message reach your heart and feed your soul. I can imagine after time, sailing the seas, you can feel very small. So I tell you this...your contribution to this planet by showing it respect and teaching others through your message is bigger than you know or could imagine. You are a HUGE CONTRIBUTOR and you make this planet a better place (and make Mother Nature smile! )What a fabulous tour you gave us. We are STILL talking about the fun we had. You are AWESOME at what you do and your passion and love for the sea is so organic! I will never forget this experience on the Esther G. God Bless You and Your Family crew! 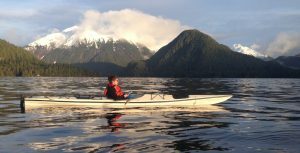 When in Sitka, we will book again." Captain Davey's enthusiasm for Alaska's land, sea and wildlife is demonstrated in his gentle, respectful attitude toward nature. Rarely have we encountered an excursion led by a person as knowledgeable and pleasant as Captain Davey. 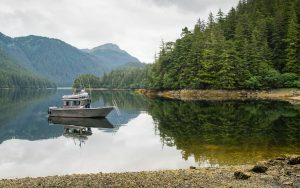 It was a rare treat to be shepherded around his special part of Alaska, whether simply listening to the utter silence of the rain forest in a quiet bay as a humpback whale cruised by, creeping past sea otters resting in bull kelp or learning about what makes Alaska so unique. Book with Captain Davey and the Esther G Sea Taxi for a worthwhile, unforgettable Alaskan experience. There are no words to describe the beauty of the area in which you live - having said that, Sitka, and the trip that you gave us was undoubtedly the highlight of our entire trip. Your enthusiasm and genuine love of the area was infectious and we thoroughly enjoyed every second of the time we spent with you. We are so glad that we decided to find our 'own' tour in Sitka and not one of the more commercialised and less authentic ones that were offered on the cruise. Thanks for the wonderful tour for the four of us in Sep 09. We had such a great time that we just had to share our tour experience with others on Tripadvisor: Click Here. Thank you! I was with David, Kathryn and Rachael Christensen on one of your amazing wildlife tours this summer. I had such a wonderful time and seeing the whale so close was a major life moment for me. To say the least..I was deeply moved. My absolute favorite moments of the whole trip....cruise and all other ports of call.....was the time I spent in Sitka. Your tour and the lovely community of Sitka defined Alaska for me. In a separate email I sent a series of shots I managed to get before I was totally mesmerized by that beautiful moment. Thanks so much. I wanted to thank you so much for the lovely day that we all had in Sitka; it was definitely a highlight of our Alaskan cruise. The weather was outstanding; we were so lucky! Your passion for Sitka was evident, and we could all understand why. We couldn’t have asked for a better way to spend our time in Sitka! Many thanks for a great day! We just wanted to thank you again for a spectacular day on the Esther G. The marine life and scenery we saw were awesome!! I also appreciate your concern and remedy for the queasiness I experienced. Once again, thanks for a wonderful trip, you helped to make Sitka one of our favorite stops on our Alaska trip. And, we share your appreciation of the great Teddy Roosevelt for his accomplishments in the areas of conservation and preservation of the great outdoors! WOW!!! Thank you for the AWESOME experience with you and Louie! Your 4 hour tour was one of the highlights of our Alaskan Cruise! We were thrilled to see the whales bubble net feeding, smell the breath of the whales! !, hear the trumpeting, observe your wildlife biologist friend on her raft taking photos, watching Louie ( and hanging onto Louie!) as he listened and watched for the whales, and of course eating the yummy Esther G sea Taxi Signature cookies! You did an amazing job and we highly recommend your excellent service to all who have the opportunity to visit Sitka, Alaska! THANKS DAVEY --- YOU ARE TERRIFIC! Thanks for giving us such a superb exposure to southeastern Alaska’s wildlife, worth every dollar we paid. When other folks staying at the B&B where we stayed while visiting Sitka praised you to the hilt for making their day and a half’s wildlife photo shoot such a success, we knew we had to sign on. And the 3 hours with you on the Esther G met our every expectation. 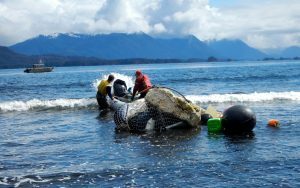 The combination of all the wildlife -- watching the purse seine with 8,000 pounds of salmon pulled into one of Sitka’s commercial salmon boats was an unexpected bonus -- and your commentary about what we were seeing was wonderful. And the Esther G provided a very comfortable ride. We highly recommend that people visiting Sitka make a booking with you. We wish you continued success. Sam and I just wanted to tell you how fantastic our excursion was with you. We had a great time. We learned a lot about "Sitka by the Sea" and your love for it. Thank you for taking the time to give us one of many highlights of our Alaska vacation. One of my dreams was to get a whale-tail photo of my own. Thanks to you, I got one! PS The cookies were a Hit TOO!! Thank you for the wonderful trip you took me, my son and daughter-in-law on July 23rd. We all enjoyed it immensely. Thanks again for the happy day you gave us. I just wanted to thank you again for a wonderful tour for me & my family on July 27th. We had so much fun, saw such much wildlife & your enthusiasm for Sitka really made the tour fantastic. Sitka was my favorite port on our 2 week Alaskan adventure! Even in the rain/mist & rough waves!Thanks again for a great time! Thanks a million for the personalized, fantastic tour. As you can imagine, it was absolutely the highlight of the week. The pictures came out great, but still don't reflect the beauty. Just wanted to send a note to thank you for the wonderful experience onboard the Esther G II with yourself and Louie the dog! I knew when I booked this tour that it would be good, as I'd read many reviews and had done a lot of research, but it far exceeded our expectations. You are so personable and very knowledgeable about the local marine life and your beautiful town of Sitka. It was our favourite stop on the cruise! Being able to see so many sea otters and bubble-net feeding humpbacks made our trip totally amazing. St. Lazaria Island was fabulous also! Thank you again for the amazing tour! It's not something we will soon forget. We have told everyone we meet about your tour and that if they are ever in Alaska to do it! My wife and I enjoyed your once in a lifetime tour in late July. As promised, here are some whale flukes. Please let us know a bit about these whales if you can. We hope to return and enjoy another tour from you one day (maybe in a year?). Our amazing boat trip in June was truly the highlight of our Alaskan adventure. Thank you for making it so special. Your knowledge and enthusiasm for the wildlife really was infectious. You created a lifetime of memories for us in just 3 hours! The cookies weren't bad either.Please enjoy the attached “Smilebox”. Click the full screen button in the upper right hand corner and make sure you have the sound turned up. The music is an original composition that 10 year old Spencer wrote and played. We really had a blast in Sitka and can’t wait to come back. Kruzoff was just great with excellent views from the top of Edgecumbe. Thanks again! Thanks for a wonderful experience on July 7th and 9th. Quentin and I had so much fun. What a wonderful experience! My mom, Carolyn, and Quentin & I all think that you have a wonderful business sense. We were all very impressed with the fact that you took us out for a second trip because you weren't satisfied with the amount of wildlife we got to see on Tuesday. We got some really good pictures and I look forward to another trip in a few years. We will definitely be back to Sitka down the road and I most definitely want to go out on another tour with you. I just wanted to send you a quick note saying thank you for taking Jarrett and me out last week while we were in Sitka. Your trip was a great way to start off our excursions. The small group size and your personal knowledge really put it above the rest. When Jarrett and I revisited our excursions at the end of the week, I was still coming back to yours as the highlight! To anyone considering a tour with Captain Davey while in Sitka I can tell you without a doubt "DO IT!". Our four hour trip was amazing. To start with he makes you feel very safe and secure. He is a true teacher and his love for wildlife and the sea shines through him. I will never forget that day, it was magical! The trip was worth every cent, plus some more! We had a 9 year old with us and she was thrilled and happy most of the trip. We worried over the potty issue but never had a problem with it, he has one and its private with a great view:) Seeing the puffins, seals, and otters was huge but even bigger than that was seeing the whales. When that gray whale came up to the boat and we could almost touch it(no we didn't try) it was like a dream. I feel honored to have gotten to experience this tour and hope that you will get the chance as well. If you have any questions or concerns he will always help you and if you want to talk to a customer you are free to email me at eek40@aol.com. Davey...thank you from the bottom of our hearts for a day that we will never forget. We just got home from our Alaskan vacation and I wanted to thank you for the perfect outing we had with you on July 3. What a gift for my family. I cannot thank you enough for such a memorable day in Sitka. Seeing the whales so close, seeing the bubble net feeding, smelling whale breath and hearing the whales immediately before their surfacing will forever be our favorite memory of our family visit to Alaska. I didn’t realize until later in the day that Justin even captured several of our encounters with the whales on his cell phone video. I am still in awe of our experiences that day. It was perfect and you were such a delight to spend the morning with. The homemade cookies and Alaskan beer were a wonderful touch to our outing. Seeing the see otters, puffins and eagles was also very special, but without a doubt, our whale sightings have touched all of us. Thanks again for what has become our family’s most treasured and favorite day ever that we have shared together. You helped us create that memory and I will be forever grateful. Keep up the fantastic work. We will definitely contact you again for a private tour in the event we ever travel to Alaska again. I was in Sitka on June 13, 2009. I also booked an excursion in Juneau and one in Ketchikan. All the excursions were very good, but by far, yours was the best! Your knowledge of the area and the wildlife was amazing. You knew exactly where to take us for the best possible viewing of whales. The size of the group allowed for a relaxed atmosphere and provided opportunities to ask questions throughout the tour. I would highly recommend your tour to anyone visiting Sitka. Thank you for a wonderful experience. Words cannot do justice to the marvelous trip you gave us. The wildlife and sea creatures and beauty are humbling. Sitka in particular had a magical quality for us. We hope to get back there in the future. Meeting you made the day perfect. Our heartfelt thanks for sharing your obviously loved special nooks and crannies on the sea. List of animals I saw on your trip:Otters,Grizzly sow and clubs, Seals, Fish,Gulls, rails, terns, cormorants, ducks, Eagles, Eagles, Eagles, Eagles, Seals, Old man otter, Old man otter, Old man otter, Old man otter, Old man otter, Old man otter, Old man otter, He just kept sleeping and I kept taking pictures.A dingy Thanks again! Our cruise to Alaska is once again over and Ralf and I are reflecting on the past week. When we left you and the Esther G we were both at a loss for words. Our time in Sitka with you was the most magical and wonderful time we could ever have imagined! Those 4 1/2 hours passed like a minute. We could not have imagined a more perfect day, more perfect company or a better tour guide. We have left of piece of our heart with you and we will return! We cannot thank you enough for your kindness. I just wanted to thank you again for the wonderful tour Rachel and I had last week (and for the great cookies!). This truly was one of the highlights of our trip! We wanted you to know your tour on the Esther G II was the TOP highlight of our Alaska cruise! We have completed many excursions on 5 cruises to Alaska, but yours BY FAR was the absolute best! We took a helicopter tour one cruise, did a glacier landing on the Taku in Juneau and a 2 hour flight-seeing tour on another cruise, to Misty Fiords in Ketchikan. We both agree yours was outstanding to even those tours. You really love Sitka and Alaska (so do we) and it comes beaming through on your excursions. We work hard to save for our Alaska cruises and usually can only afford one really great excursion per cruise. We are so happy we selected yours! We WILL be back for another tour with you, hopefully next year! We will also tell friends and relatives! P.S. Your daughters cookies ROCK!! We had a fabulous day, and we will never forget our experience with you. Enjoy! Thank you again so much for the beautiful afternoon on your ship! I had an amazing time and it has truly been a once in a lifetime treat for me! Almost a year after I met you and spent a few hours sharing the amazing wildlife and gorgeous scenery on your boat, this excursion with you remains the strongest and most beautiful moments of my trip to Alaska! The waves, the smell of the sea, the cup of sweet tea we had when we stopped in the little creek, and your knowledge of the fauna and surroundings made it the perfect little extravagance that made my trip! Thanks so much for the great tour early July. We felt so fortunate to be “mugged” again by humpbacks. Got some great pic’s! I want to thank you for this wonderful adventure you took us on and wish you the best in all you do. It was so nice to have finally met you. Thank you so much for taking Nate and I out on your boat last December. The whole time in Sitka was amazing and you provided us with memories that will last a lifetime, seriously!! Hope to see you again sometime soon. Again we wanted to tell you how much we enjoyed our day in Sitka. Your tour was terrific and can only be explained in words such as awesome, cool, wonderful and exhilarating. As Sitka was our last Alaska stop, we weren't expecting to see more than we had previously seen in Skagway, Juneau & Ketchikan. We were wrong! We saw more during our trip with you than we did in the other places. Even though we saw humpbacks & gray whales, sea otters, eagles, and seals, our favorite was the brown bear we spotted on shore so close to us. The pictures turned out pretty good. I'm attaching some pictures from the trip. When we return to Sitka, we will be calling you again for another tour. In the meantime we will spread the word about the Esther G and the tour not to miss! "Captain Davey is awesome, he guided us 2 days on our Muench Workshops Sitka trip - fun, personable, awesome whale finder and great captain! Woop!". We all had a great time that day & thank you for the experience..
We enjoyed very much the days spent in Sitka, It is a really marvelous place, I hope I have the opportunity to visit it again and spend some more time. We're back in Phoenix now, but we keep talking about the guided tour you gave us last Monday (Oct. 4th). When our business trip to Sitka was postponed from August to October, we thought that we would miss out on adventures like whale watching. Thank you so very much for taking us out on the Esther G! We saw so many whales and sea lions too, honestly, I don't think we could have had a better experience. We appreciate your time and expertise. Hope we can book a tour with you again some day. Hi Davey! We gave you another shout-out in our tour diary. Check it out at redmolly.comThanks again for showing us our first whales ever! Thanks for the tour you took us on in your boat. We really had a great time. It was so fun to see the Orcas, Humpbacks, otters, sea lions, and other animals. Thanks again, we really enjoyed meeting you too. ………..in Sitka I took a whale watching boat ride. It was terrific!! I saw two kinds of whales, puffins, bald eagles, salmon, starfish, seals, otters and all sorts of other wildlife. Captain Davey was great and just loved his job!! What a way to live: earning your living while doing what you absolutely love to do!! And his daughters baked some of the most delicious chocolate chip cookies I've ever put in my mouth!! We think fondly and often of the wonderful day we spent with you in Sitka. We shall never forget the "Esther G" And her skipper!I can only imagine the smoked salmon you eat at your break fast on Yom Kippur!! We just wanted to thank you so much for a wonderful day we will cherish forever! John and I had a wonderful time with in Sitka. What a glorious and joyous job/business you have! We loved every minute. A perfect honeymoon for us! Thank you again for a great time. You are an enthusiastic, informative and experienced guide who I would recommend in a heart beat! I just wanted to drop you a note and say "thank you" for the wonderful excursion you put together for my sister Karin (Sheppard) and I on May 20. You were not only knowledgeable, but very obviously in love with what you do and the area you live in. I couldn't have asked for a better day! Wanted to say thanks again for the awesome boat trip. Our family loved seeing all the wildlife, especially the grey whale and the otters. It has become one of our favorite memories of the cruise! Spending a half-day with Davey on the Esther G allowed us to truly experience the beautiful Alaska coast. Davey's knowledgeable commentary on the plants and animals of Sitka together with the close up viewings of humpback whales, sea lions and sea otters ensured our future trips back to Sitka. Your wildlife tour was the highlight of our trip! Once again thank you for such a wonderful trip last week when we were Sitka. We all agreed it was the highlight of our cruise. A special thank you for treating us to the wonders of SE Alaska. I appreciated your patience for taking us to some spectacular scenes and wildlife. I would also like to thank you for the cookies. Thank you for the tour of the Sitka Sound, we had a great time aboard the Esther G! Your knowledge of the area's history, landscape and wildlife was very impressive. It is not an exaggeration to say that the couple of hours we spent on the water with you were the highlight of our trip to Alaska! "This summer we took a cruise to Alaska to celebrate my 50th birthday. As a family of four, 2 adults-2 teens, we left Amsterdam ( Netherlands) to take this trip we had all been looking forward to so much. I had prebooked some excursions in various ports of call. Reading reviews of others on tripadvisor had helped me in deciding which ones to choose. As we wanted this trip to be a family experience, I was delighted that Davey offered private tours for a party of four, so we opted for a 4-hour boat trip in Sitka. Davey's enthusiasm and obvious love of all Sitka had to offer made us look forward to this trip more than the others. When we set foot in Sitka on July 19th, the mountains were covered with low clouds. Until then we had been very fortunate with beautiful weather for the previous 10 days. We met Davey at the harbor and he made us feel very welcome. After going through the safety procedures and Davey's checking of what our interests were, we took-off. We managed to convince Davey to pick up his dog Louie, so we first went to his home. After that, we immediately ran into a humpback whale, checking out the bay in front of his house. The clouds started to lift and we were surrounded by the most beautiful and serene quiet surroundings. 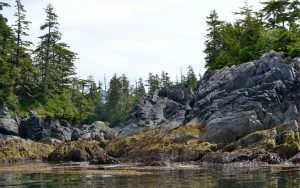 Mountains covered with lush green trees, clouds slowly lifting, clear waters with loads of starfish and rocks covered with kelp and of course all its equally beautiful inhabitants. We saw humpback whales, otters, sea lions, seals, deer, jumping fish, bald eagles etc. Louie especially had a good eye for spotting whales! The kids loved that dog. The weather conditions proved to be ideal for taking wonderful pictures. The layout of the boat helped as well! Davey proved to be very knowledgeable and was more than eager to share this knowledge with us. He showed us why he loves this place and we definitely want to go back there. Davey has a wonderful, warm personality and if you are looking for something special, not standard, rather catered to your personal needs, this is the trip to book in Sitka. Next time we go back, we'll book him for the whole day! Capt. Davey!~ Just a quick note to tell you I am still cherishing my trip on the Esther G and seeing my first whale breach! I am sending you some people too! Everyone who asks about Alaska, I tell them about you, your boat, Sitka being my favorite and - if I had been in my twenties - I would probably have stayed in Alaska, too! Beyond words beautiful! Thank you!! We had a wonderful adventure aboard your boat. Your love for Alaska came through loud and clear. We couldn't have asked for a better day! We were curious about "Domino" though. Does he just hang out in that area and you are pretty much guaranteed to get see him? I was amazed at the performance we saw! Does the fluke-flapping mean something in particular - like a warning - or is it playful? Thank your girls again for the wonderful cookies. Thanks again, I will be recommending your services to anyone heading your way! Attached are several photos of the bear that we saw near the dip-netters (up Redoubt Lake?) on our trip with you on 7/6. We also have a couple photos of eagles on the whale carcass if you're interested. We all had a great time on our trip with you. Jan and I are hoping that we will get a chance to do it again and possibly even get out to St. Lazaria next time. We always think that we live in a beautiful part of the world but the Sitka area surpasses it. Thanks for showing us around. Thanks again for the great boat ride week before last. Between the whales, the sea birds, the otters and the views of Mount Edgecumbe, it was a fantastic success! THANK YOU to both of you for a most memorable time in Sitka. Lisa and the history and charm of Sitka and Davey with the magnificence of the whales gifted Bettye and me and our girls with a lifetime of enduring memories of great folks in a beautiful and historic city. We all send our sincere and lasting gratitude. We were all impressed with the perfection of Sitka as your home, and you folks as the heart and soul of Sitka. Just wanted to thank you for the ride to and from Kruzof Island. We had a great time in both Juneau and Sitka, but I definitely liked Sitka more. I hope to return with my wife and possibly my daughter in the next year or two. Thanks for all the information you provided beforehand and for your hospitality while we were in town. Captain Davey---I was on your boat last week and just wanted to thank you for a TERRIFIC time---it was a fantastical day in part because of you. I can tell you really enjoyed showing us around the coves and being out on the ocean. I felt more like a friend than a paying guest. The Esther G is a fun vessel!! Let your daughter know that I appreciated the cookie too, nice touch. My friends and family ask me why I keep going back to Alaska, I am already thinking of coming back for Sitka WhaleFest in November!! Thanks again for a very fun time. Davey, the wildlife boat tour that you gave us while we were in Alaska was the highlight of our trip, I'm so grateful to Sherry and Laurie for making the arrangements. Thanks again for a fabulous time! Last Christmas we took Bob's son and his wife on the Esther G . We wanted to give them a gift of an experience and we no longer have a boat. It was glorious. Blue skies, sunshine, glistening water and snow was covering all the trees and mountains. We saw many whales and schools of sea lions. We had delicious scones and Davey made it so much fun. Today I looked at the pictures again and it was such a great memory. Thank you, Davey! We enjoyed our tour very much. Your knowledge of the area and your obvious love of Sitka and its wildlife made all the difference; the cookies didn’t hurt either! Sitka was our favorite Alaskan port and we hope to return someday. Thanks again! The day we spent with you was the best day of the entire trip for me. I am proud to know a man who is following his dreams. There has to be some sort of natural luck built in to the Esther G and Davey Lubin. We were surrounded by so many whales while being guided by Davey’s knowledge of them, and I would have never guessed that you could smell their fishy, krill induced breath from the boat. Although our intention was to watch the whales, Davey made sure to point out bald eagles and other birds flying nearby. Davey’s kindness and passion for marine education made our experience on the water both exciting and empowering; I know more about the ocean and can say I have really seen humpback whales in their natural element. Thank you much Davey and the Esther G! Thanks again for everything. You gave us an amazing boat tour, certainly a highlight for me! After everything has been done, the day we spent with you was voted best activity of our entire Alaskan trip. I will be sure to get some reviews posted to your website from all my family members. Hope all is well. I just want to let you know that we had the most wonderful time on your boat and on shore!! I have to brag to everyone about the fun trip we had with you!! Thank you for all the fun!! All of us truly enjoyed it!! On our very first trip up to Alaska, whale-watching with Davey was an exceptional highlight. Such a knowledgeable and fun guide, and we saw so many whales, couldn't even count the number! It was a pleasure we will always remember. 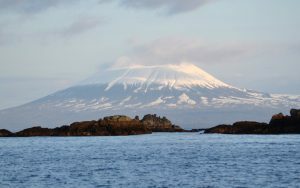 What a day we had yesterday..it surpassed our expectations for our explorations of the Sitka waters. It was a thrilling adventure, spectacular in every way. Thank you for sharing your time, your expertise, and your passion for this beautiful place. The treat of salmon, kelp and sable soup was an additional pleasant surprise. We will pass the word along about your tours and the exceptional service you provide. Thank you so much for showing us your Alaska! Those few hours spent cruising with you on the Esther G were truly the highlight of our trip to Alaska, we could not have asked for more! Thanks for a wonderful tour! Thanks again for the fantastic boat trip, Davey. It gave me a whole different perspective on Sitka and the southeastern Alaskan coast. We wanted to thank you again for a fantastic day in your beautiful Sitka. The girls talked about it day and night and I'm sure everyone in the family in Minnesota will hear all about it! Cheryl and I want to thank you for the great boat trip you gave us out on Sitka Sound. We loved seeing so many whales and sea otters and we learned a lot from you about the very special marine environment of SE Alaska. "Bliss”—that’s the only way to describe the morning our family spent exploring Sitka Sound with you on the Esther G. Thank you for suggesting we close our eyes and just listen to the sound of the whales spouting water all us. Otherwise we might been distracted by the beautiful snow-capped mountains in the distance, or the sight of the lazy otters floating by, or the eagles and puffins flying above, or the gigantic purple starfish stuck to the cliffs. Our voyage was as good as it gets. Thank you for your wonderful stories, for sharing your enormous knowledge, and for making us fall in love with Sitka. We will be back! Mark and I wish to thank you once more for our wonderful time on the water with you. I'm still gobsmacked by the beauty we encountered in the sea cave at St Lazaria. The brilliant colors of the algae, sea stars and sponges was Nirvana to my eyes and camera lens. You really went out of your way to make two travelers feel at home! When we flew out of Sitka, I kept a watchful eye on the water below for any signs of spawn. Mercifully the water and land were not obscured by customary clouds. Less than two minutes into our flight all of a sudden a big gaping maw lunged out of the water creating a big patch of white foamy splash. A humpback whale had just surfaced and lunged below the plane, surely a good omen. For Mark and me there could be no finer fare thee well. Thank you for a absolutely fabulous day! We've run out of superlatives trying to describe it. Everything was wonderful from start to finish. It was lovely to spend the day with you and Louie. I have attached some photos. Again a million thanks for everything. 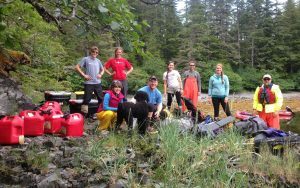 Thank you a ton for all your help and support for the Sitka Sound Science Center camps and other programs. Thank you for the best outing of our wonderful week in Sitka. It was memorable to see the first 3 gray whales of the season..... so close! And, finding fresh herring eggs on the seaweed was amazing, so fresh! Thanks Davey for a wonderful trip, just amazing....... What a great job you do! Thank you so much for showing me beautiful Sitka, it was so great to see all the wildlife. Thanks for sharing your wonderful knowledge, experience and, of course, your super-cute dog! On behalf of Jeff, Kristi, and myself, we would like to let you know that out of two Alaska trips and many many ho hum shore excursions, yours was absolutely the best! We hope you will add us to your 2013 testimonial list. We appreciate all of your efforts to insure that we would see not only the beautiful sights but also the wildlife my Granddaughter and I were craving to see. Part of her homework was to write at least 5 sentences in a daily diary. On the day you took us out on gorgeous Sitka Sound, she wrote an entire page and ended it with "It was my best day ever". We wish you the very best and hope to see you again one day. Thank you for an extraordinary day on the water! Thank you so very much for such a fantastic and memorable boat ride filled with so much laughter and a lot of Happy screaming. We loved every moment and minute of it. My daughter loved the doughnuts. :-) so did all of us. Hope to see you in November [for Sitka WhaleFest www.sitkasoundsciencecenter.org ]. Most amazing trip EVER !!! No kidding!!! It was last week, early February 2014 and we had the best experience you could imagine. In a one hour and fifteen minute trip we saw a bunch of whales, piles of sea lions and eagles sitting on trees. Not a cloud in the sky and Davey Lubin gave us tons of information about the sea life and the history of the region. I did a trip with him in 2007, as well, which was quite amazing too. Because of the excellent weather, this was an even better trip. I highly recommend it. Davey, you ROCK!!! We were a group of ten and Davey was able to arrange for a second boat to accommodate us. We had a great time. Davey was excellent in keeping in touch beforehand, answering all questions, any was very prompt in returning emails. We met at the designated spot just a short walk from our ship with no problem. He is very knowledgable and we all enjoyed listening and learning about Sitka and the wildlife we were able to see. We saw whales, seals, otters,eagles. lots of salmon but unfortunately no bears. He is truly passionate about his home and very enthusiastic to share his knowledge. I would recommend taking his tour. My boyfriend and I booked a private trip with captain Davey after the locals in the pub said he was one of the best. It was a beautiful trip with an interesting perspective of Sitka from the water. When we were in the middle of the humpback whales and thought things couldn't get any better, Davey pulls out cookies and coffee. Customer service at its best. Captain Davey created an amazing adventure for my son and me during our visit to Sitka. A charismatic Captain who coupled his expert seamanship (I have never felt safer on the water) with his encyclopedic knowledge of the Southeast Alaskan waters to create a once in a lifetime adventure that was the highpoint of our trip to Sitka. While we marveled at the bald eagles, sea lions, and sea otters that Davey pointed out, we were truly left breathless by the 20+ whales we drifted amongst for more than an hour. During this magical hour we captured numerous photos that are sure to become treasured family moments. My son and I also had numerous questions about the whales and other wildlife, the history of Sitka, and life in Alaska....all of which Davey happily answered while weaving in a colorful story or legend. I cannot overstate how a trip with Captain Davey is a must do for anyone visiting Sitka! I offer this 5-star rating only because a 6-Star rating isn't an option!!! We had an afternoon trip, and it turned out we were the only passengers. Dave invited a few of his naturalist friends along, so we got to go to their favorite spots and hear interesting info from all 3 of them (and they brought snacks - how lovely). His knowledge of the birds was amazing, and he was able to show us a large variety, their rookeries, and a beautiful island reserved for studying wildlife (at which we also met some of the scientists working on the island). The boat is dry and warm and gives a very smooth ride. After seeing countless bird species, otters, whales, eagles and a few deer, Dave indulged us in looking for bears. Sitka had the most beautiful scenery and wildlife of our whole trip (7 day cruise from Seattle to Glacier Bay). We started off our trip to Sitka with a four hour trip on Dave Lubin's Esther G II. Dave is a naturalist and biologist and expert on the area. He is also very personable. We saw numerous humpback whales, seals, seal lions, river and sea otters and abundant birdlife. We enjoyed our first trip with him so much that we scheduled a second four hour trip two days later. If we return to Sitka someday, Dave will be the first person we call. Save yourself a lot of trouble and simply book with Davey on the Esther G. You won't find a better option -- he is responsive, caters to the interests of your group, is a wealth of knowledge, and is a joy to be around. We're picky and tend to be over-critical, and we thought our time on the Esther G was stellar! Private tour with an excellent captain and unconditional recommendation! We booked the Esther G for a private tour while our Holland America Ship was docked in Sitka. We wanted a private experience catered to our needs and wants since we had our father with us who is slightly handicapped and in need of a scooter to walk long distances. Davey met us just steps from his boat and was immediately helpful in making sure our father was comfortable and able to enjoy the tour. Due to the shuttle buses from the dock our ship was at to the visitors center in Sitka where we were to meet Davey could not accommodate our scooter but on one of the shuttles running we were nearly 30 min late meeting Davey. I immediately told him to just adjust the tour to accommodate our being late so that his schedule would not be interrupted. However, while on the tour he made some phone calls and changed his schedule so he could give us the complete tour. Within minutes of boarding we were surrounded by several humpback whales getting an up close encounter with them. Needless to say this was amazing. After spending a good amount of time with the whales we were off to see if we could find bears. On our way we passed several little islands with otters and birds. We also passed an island that was literally covered with Bald Eagles. While we did not find a bear the scenery was amazing and the knowledge Davey had was very educational and fun to listen to. Would highly recommend this tour or any services Davey offers on the Esther G.
AWESOME Whale/Wildlife Tour! My daughter and I sailed with Capt Davey on the Esther G. We located a couple of Sea Lions as Capt Davey led us to a large pod of Humpback whales (about 30+). He knew exactly where to locate the whales and we gleefully watched them breathing and sounding for over an hour! We then went to Sandy Cove and sighted two Brown Bears and some Jellyfish. Capt Davey is extraordinarily knowledgeable and enthusiastic about the wildlife in the Sitka Sound and has a great excursion boat in the Esther G. What a wonderful trip; THANK YOU CAPT DAVEY! Best Whale Tour Available. Came to Sitka to visit some friends and had the opportunity to take a whale watching tour with Esther G Sea Tours and Taxi. It was incredible!!! He was an excellent captain who made the adventure the overall trip highlight and an amazing memory. I would highly recommend this tour to everyone coming to Sitka. Thank you! This is the #1 MUST DO in Sitka. Locals who know him will tell you to wait for him . . . a definite once in a lifetime chance to see Alaska's wildlife up close while learning about the land, sea and animals. Davey's passion is shamelessly alive and well. Our group was comprised of ages 15-68 years old, some knowledgeable about Alaska but most were not. We can't stop talking about it. From the moment we stepped on his boat he felt like a friend who made us a part of his world and we did not want to leave. He is the best there is!! Worth every penny and yes, beyond awesome! This was one of the highlights of our trip. We had booked the trip prior to our cruise and were excited to get out on the water. Davey met us in Sitka, and we headed out to sea, ultimately about 18 miles out to sea around the Saint Lazaria National Wildlife Refuge. this place is breathtaking. Abundant wildlife, pristine scenery. Whales, otter, seals, puffins, cormorants, eagles. Davey is extraordinarily knowledgeable about the region and it's character. He is the consummate professional; beginning with our initial phone call to setup the trip and throughout the entire adventure. His passion for the area and the wildlife shows through, both in his deep knowledge of the animals that w were seeing through to his conservation mindset which we truly appreciated. For those here that have complained about "shifting pricing" in other reviews, that is simply not true. Davey was clear from the beginning about what to expect. It is well worth the experience (and the cost) to spend an afternoon with Davey. I highly, highly recommend Davey to anyone wanting a top notch experience during your visit to Sitka. So grateful to be on Captain Davey's boat. I've returned several times because Davey and his first mate, poodle George, provide such an enjoyable experience out on the sound. Davey is keenly knowledgeable about the flora and fauna of the area and has so much to share. He seems to always know just where to go in order to find active whales or quiet bays for enjoying lunch surrounded by the splendor that is Alaska. I highly recommend hiring Davey and the Esther G.
We had the pleasure of spending 3-hours w/ Captain Davey (and Esther) while our cruise ship was in port in early June. This type of excursion was recommended by our friends but none had been out on the water w/ Captain Davey. Life is about experiences and, without question, this was the best experience we've ever had. Captain Davey was warm, welcoming, patient (we brought 4 little kids), passionate and extremely knowledgeable of the area. The views were breathtaking, the knowledge we gained was priceless and the Chocolate Chip cookies were delicious. We experienced Whales, Puffins, Murres, Sea Otters, Sea Lions, Eagles & Falcons (and I'm probably forgetting a few more). I am convinced there is no better way to see Sitka. We sadly disembarked after only 3-hours together and immediately started to discuss, "How do we move to Sitka". This trip had a tremendous impact on our lives and we owe that to Captain Davey. He is a great man and someone who wears his love for his City/State on his sleeve. Do yourself a favor and book a tour through Esther G Sea Taxi. You will not regret it. What an amazing experience! Captain Davey’s tour came highly recommended and it lived up to its legend. We had 6 family members aboard ranging in age from 7 to 60+ years. All of us were thrilled with the whales, wildlife, history and birds we were able to experience. 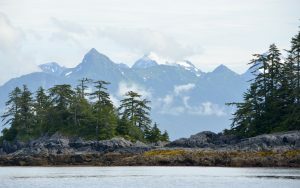 Our journey over to Saint Lazaria Island was wonderful as we took a very nice tour of the bay and saw Sitka from the water before setting a direct path to the Island. Captain Davey gave us the history of Sitka in a very engaging manner. As we approached Saint Lazaria, it became obvious why this island was so special. Birds of all kinds everywhere, especially the many types of Puffins. Each area of the island had a different view to it, so we were glad we were not rushed and could just stop and explore and see more closely with binoculars the nesting activity. Captain Davey capably answered our many questions. We then headed to a different spot where sea lions, sea otters and more birds were hanging out - amazing views. Captain Davey then spotted some whale “spouts” in the distance and quickly got us to the scene where we were surrounded by humpback whales! One whale came within 50 feet of the boat! What a fantastic experience for our family. One we will be talking about for a long time! Also, Captain Davey has so much expertise in all creatures - marine or avian, and of the area. We highly recommend this tour while you’re in Sitka! Thank you, Captain Davey!